Since 1994, Komen Northeast Ohio has worked to better the lives of those facing breast cancer in the local community. Through events like the Akron Race for the Cure and Cleveland Race for the Cure, Komen Northeast Ohio has invested more than $15 million in community breast health programs in its 22 county service area and has contributed more than $5.7 million to the more than $889 million invested globally in research. 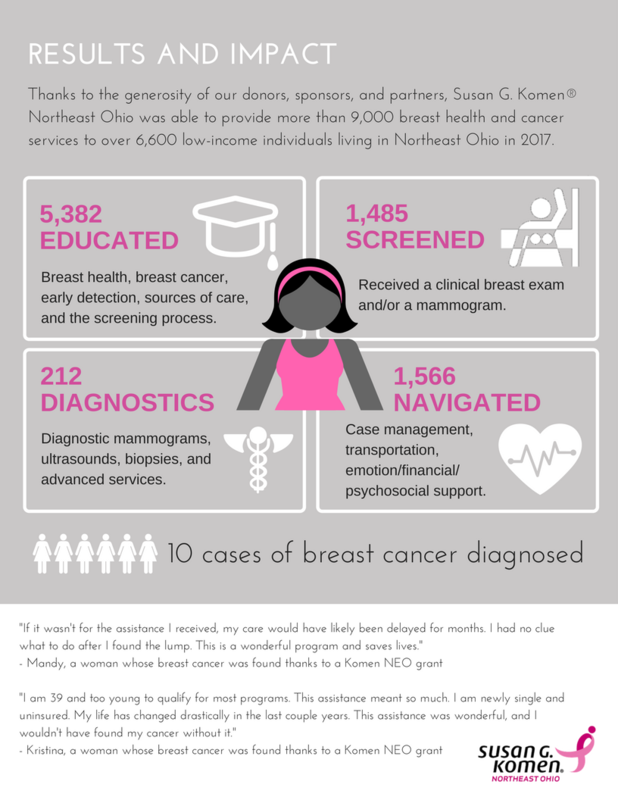 Click here for a one-page fact sheet on the various ways Komen Northeast Ohio invests in our community. Our Community Grants program is designed to make systemic, lasting change in our community. Our funding cycle runs from April 1 – March 31 every year. Learn more about our Community Grants program. Results from the 2017-2018 Grant Year will be available in May, 2018.